Razor’s Razor Hovertrax 2.0 is one of the top hoverboards (two-wheel self-balancing electric scooters) on the market. With 2.0 edition Hovertrax is experiencing strong comeback to the hoverboard market. Razor is well known and trusted company established in 2000 and till today has grown to one of the leading companies on hoverboard market. Razor uses high quality and durable materials, like shatter-resistant polymer frame, to prevent possible scratches and damages when you ride Razor Hovertrax. However, you can’t avoid small scratches during the normal use. Top speed of Hovertrax is 8 mph and you can continuously drive it for maximum of 60 minutes. It has maximum weight limit of 220 lbs. Also, a 15 degree tilt allows Hovertrax 2.0 to climb small hills. The Razor Hovertrax 2.0 is equipped with two electric motors (with maximum power of 350 kW), one for each wheel, Lithium ion quick-charge battery pack, rubber wheels with aluminum hubs, balance level indicator, charger and as the most important feature comes smart balancing gyro-sensor technology which enables the Razor Hovertrax 2.0 a super smooth ride. New features of Razor Hovertrax 2.0 include cool-blue LED light bar display, fender bumpers, LED battery power indicator, and two riding modes, training and normal use. All this gives Razor Hovertrax 2.0 new edge on the market. 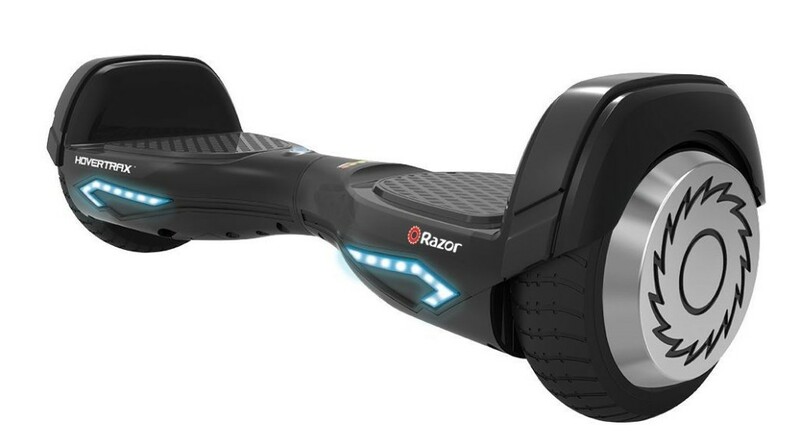 The Razor Hovertrax 2.0 has 90 days warranty against manufacturing defects. This way one of the main problems about hoverbords, like early defects present at some lower quality hoverboards, is prevented. It is available in black, blue and white color and at the moment its on special discount.